"TrustTLift" is an exterior vertical lift used primarily for lifting persons with physical disabilities from the ground level up to the main floor of their home. It is designed to meet US and Canadian safety standards and can easily be adapted to various situations. Our Straight and Adjacent Lifts are Available for Immediate delivery! 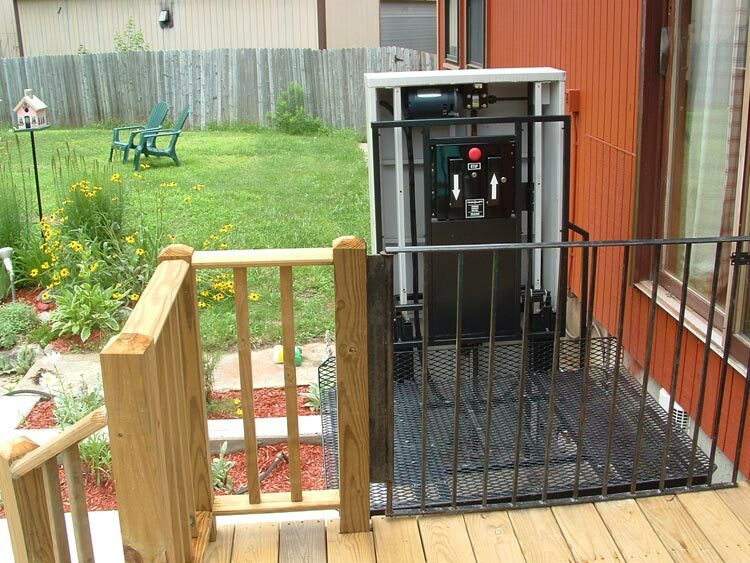 Affordable Mobility has the skill and experience to offer a complete installation package at an additional cost: we can pour the concrete pad, build a safety gate and a licensed electrician will install a safe 110VAC electrical outlet. Rigid guide rail system that does not require backing plates or block walls, and can be placed in a wood framed shaftway. Quiet, smooth traction sheave drive system with counterweights for energy efficient operation. Carriage interior finished with melamine paneling, non skid flooring, recessed lighting and a handrail. Self closing, half swing bi-folding doors allow easy access for wheelchair users. Emergency access at every landing. Can be installed in various 2 and 3 storey commercial buildings, eg. Schools, Churches, Apartments and Senior Citizen's Centres etc.